January is a great month to pursue new beginnings. Last January we discussed New Year’s resolutions and how not to overwhelm yourself with too many goals. Even if we were not successful last year, we can start from right now. January is a great month to pursue new beginnings. The best place to start is in what we eat. We can start by not getting rid of anything, but by increasing our water, vegetable, and fruit consumption. This will begin your journey to a healthier you. The next natural step is to put on those support stockings or support socks and increase your activity level. Start with attainable goals that fit in your current lifestyle. If the only walking you do is from your car to the grocery store, then park a few spaces further away from the entry. Increase your goals as you reach your objective. Your morning should not have to start like this! Now the big question is…have you been wearing those compression stockings or compression socks or have they been sitting in you dresser drawer? If they are not on your legs, you are doing yourself a disservice. 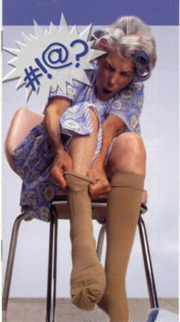 We’ve all gained a few pounds or lost a little “muscular integrity”, and the support stockings will increase the circulation in your legs and help them feel better while you are increasing your activity.I know they are not easy to get on and some of you say, “I just can’t get them on”. Yes, you can! Our Certified Fitters at Support Hose Store know the “Secrets of the Best Fitters”! You might want to take a look at Secrets of the Best Fitters in our September 9, 2008 blog entry. If you are still having trouble, please call our Certified Fitters at 1-800-515-4271 and they will help you walk through the donning techniques! Be sure to take a look at the iHealth Blood Pressure Monitor. Rod uses this to keep up with his blood pressure and loves it. It takes your blood pressure on the way up, not on the way down.